Callinex Intersects 18.7 Meters of 5.8% Zn Eq. at the Nash Creek Zinc Project - Callinex Mines Inc.
NC17-245 was completed to test the theory that historic drilling intersected unreported mineralization due to inadequate sampling based on visual observations. Vancouver, British Columbia – September 12, 2017 – Callinex Mines Inc. (the “Company” or “Callinex”) (TSX-V: CNX; OTCQX: CLLXF) is pleased to announce results from four drill holes completed at the Company’s 100% owned Nash Creek Project located within the Bathurst Mining District of New Brunswick (See Figures 1 and 2). Hole NC17-245 was drilled approximately 20m from historic drill hole NC79-06 that had only one 1.3m sample taken which assayed 2.2% Zn and 0.4% Pb (See Figure 3). The drill hole was completed to test the theory that historic drilling may have intersected unidentified mineralization due to inadequate sampling based on visual observations (See Figure 4). Drill hole NC17-245 was collared into mineralization and the first 19 samples all intersected above 2.5% zinc equivalent mineralization (“Zn Eq.”) resulting in an 18.7m intersection grading 5.8% Zn Eq. (4.6% Zn, 0.7% Pb and 23.1 g/t Ag) beginning at 10m depth including a higher grade interval of 5.0m of 8.9% Zn Eq. (7.2% Zn, 1.2% Pb and 31.4 g/t Ag) (See Table 1). The 1.3m of 2.2% Zn and 0.4% Pb intersected in historic drill hole NC79-06 was the only sample submitted from the hole for assaying. This sample from hole NC79-06 compares favorably with a similar intersection in hole NC17-245 at approximately the same depth that is contained within the larger 18.7m interval grading 5.8% Zn Eq. Interestingly, the sample from NC79-06 was obtained further down hole than the high-grade zone of 5.0m grading 8.9% Zn Eq. in drill hole NC17-245. The Company’s technical team was aware of limitations with relying on visual estimates for selecting drill core samples. Prior to Callinex’s initial exploration campaign at Nash Creek a rigorous core sampling policy was implemented. It is also noteworthy that approximately 48% of historic drill holes in the Company’s database were not drilled beyond 100m depth, where potential open pit mineralization exists within certain areas of the deposit. Additionally, of all the holes drilled prior to 2017 less than 30% of the total hole length was sent to a laboratory for analytical testing. As a result, there may be an opportunity for additional testing to identify mineralization that could be included within an conceptual open pit. Further work will be required to evaluate the potential for additional unreported mineralization. 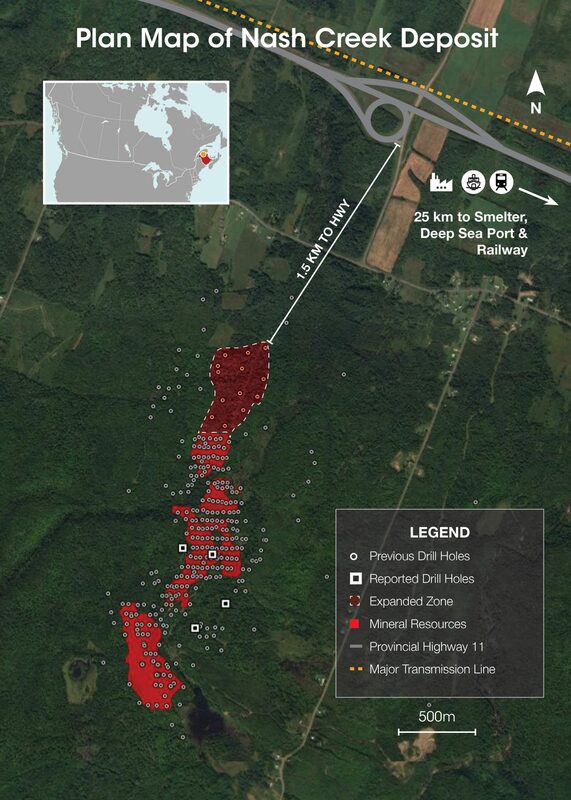 Drill hole NC17-242 also intersected significant mineralization including 13.3m of 3.3% Zn Eq. (2.6% Zn, 0.5% Pb and 14.4 g/t Ag) at a starting depth of 77.9m. This hole intersected a mineralized zone known as the “Satellite Zone” that may represent an additional opportunity for resource expansion near the southern area of the deposit. Recently, Callinex announced that it has expanded the Nash Creek Deposit approximately 500m to the north based on recent drilling (See News Release dated September 5, 2017). The Nash Creek Project is ideally situated approximately 1 km south of Provincial Highway 11 and has access to power supplied by a nearby 450 MW power station (See Figure 1 and 2). 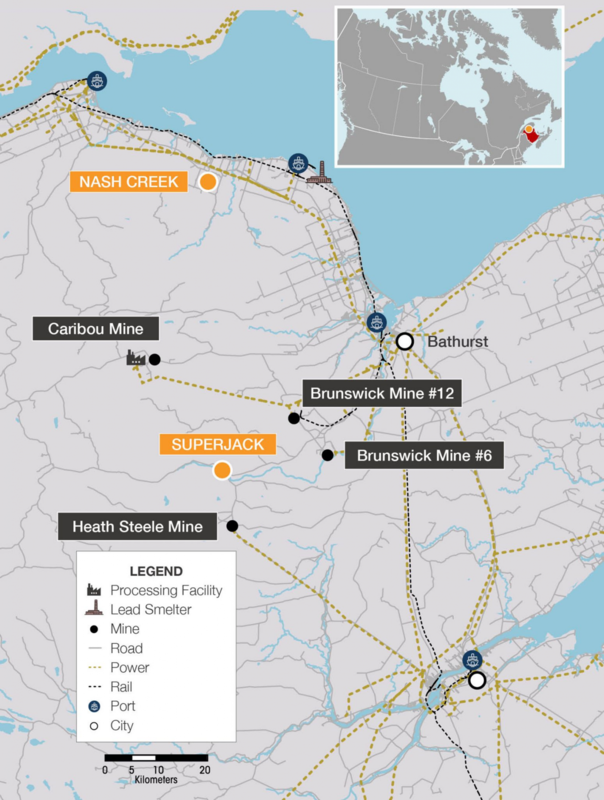 Additionally, the Project is located 100 km by road to Trevali’s Caribou Mine and 25 km by road to Glencore’s Belledune lead/silver smelter, which has direct railway access to Glencore’s Canadian zinc smelting and refining operations. The southern 1.5km of the 2km long Nash Creek Deposit contains an indicated resource totaling 712 million pounds of Zn Eq. mineralization and an inferred resource totaling 88 million pounds of Zn Eq. mineralization (See Table 2). The Superjack Project located 100 km by highway to the southwest hosts an additional near-surface inferred resource totaling 328 million pounds of Zn Eq. mineralization in the Bathurst Mining Camp (See Table 2 and Figure 1). 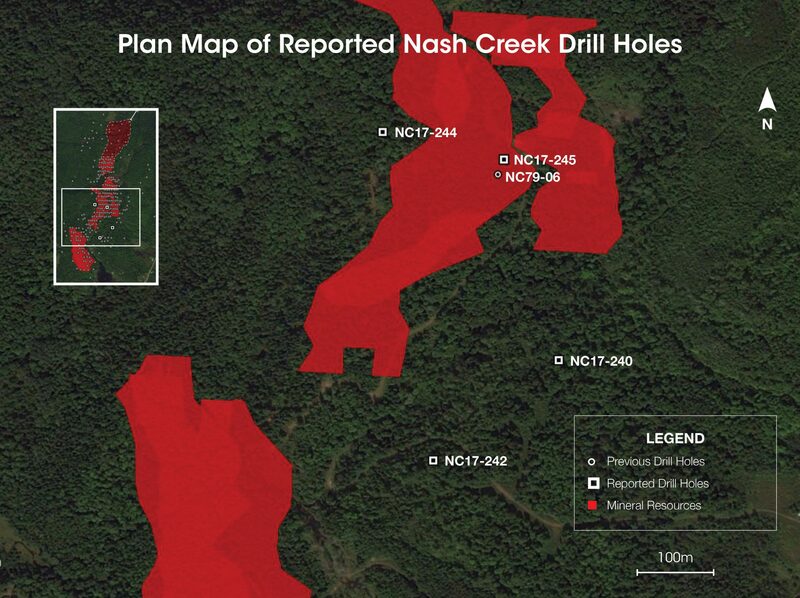 The Company has now reported results from 23 of 24 drill holes totaling 4,613 m completed at the Nash Creek Project. Additional drilling is anticipated to occur following the completion of ongoing drilling at the nearby Superjack Project.